The FBM-1 is a block occupancy detector designed to connect to the Free-mo occupancy bus providing train detection for a section of track on a Free-mo module. RJ45 jacks make connections to other occupancy bus modules very simple. Although designed for Free-mo modules, the FBM-1 can be used on any model railroad layout where block detection is required. Train detection is accomplished by routing the DCC track feeders through an air core transformer located on the FBM-1 board. When current flows through the track feeder wire, the module detects that current and delivers a stop signal to the occupancy bus which then sets the signals on a cascade module down the line. The FBM-1 is microprocessor controlled ensuring proper output signals to the occupancy bus so that signals do not flicker when a section of track is occupied by a loco with dirty wheel sets. The FBM-1 has been designed for universal operation. The occupancy bus is compatible to work with any Free-mo module that follows the Northern California Free-mo wiring standards for the occupancy bus. 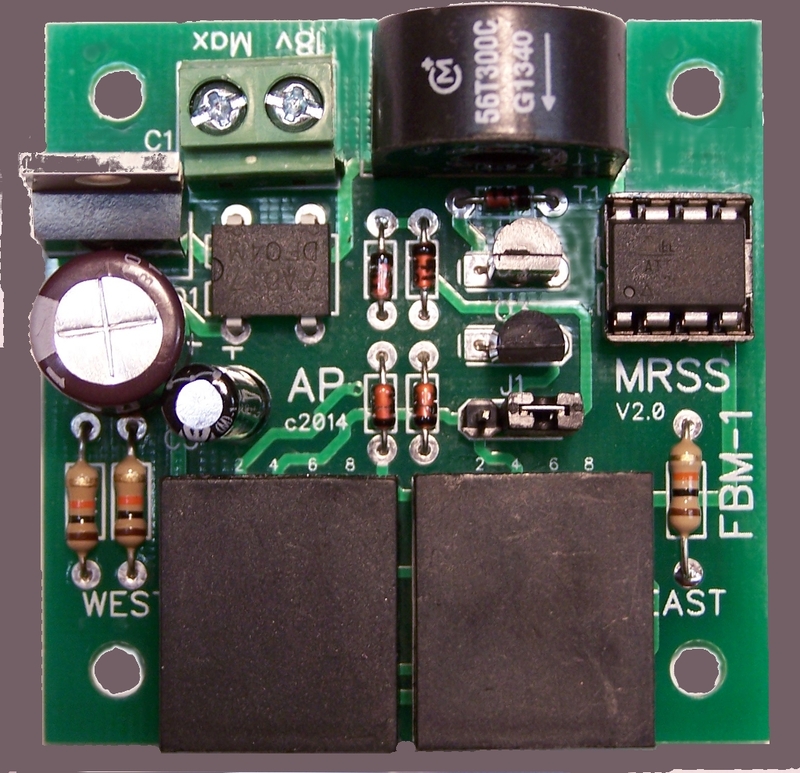 The FBM-1 board consumes very little current and the board can be connected to any 12 volt supply or the Accessory bus for power. * On board isolated block detection. * Terminal strip for easy power connections. Connections to the FBM-1 board are very simple. There are only two screws to connect power to this board. The track feeder wire loops from the DCC bus, through the air core transformer and then to the tracks. The FBM can be powered from several sources. The maximum current draw for the unit is about 15mA. -- 12 volt power supply or battery. The FBM-1 can be connected to other signal boards that are compliant to the Free-mo wiring standards for signalling.